Or view larger version. Four Oakland Larks pitchers. 1946–1947. Photographer unknown. Gelatin silver print. Collection of Oakland Museum of California. Gift of the Richard T. Dobbins and Judith P. Dobbins Collection. 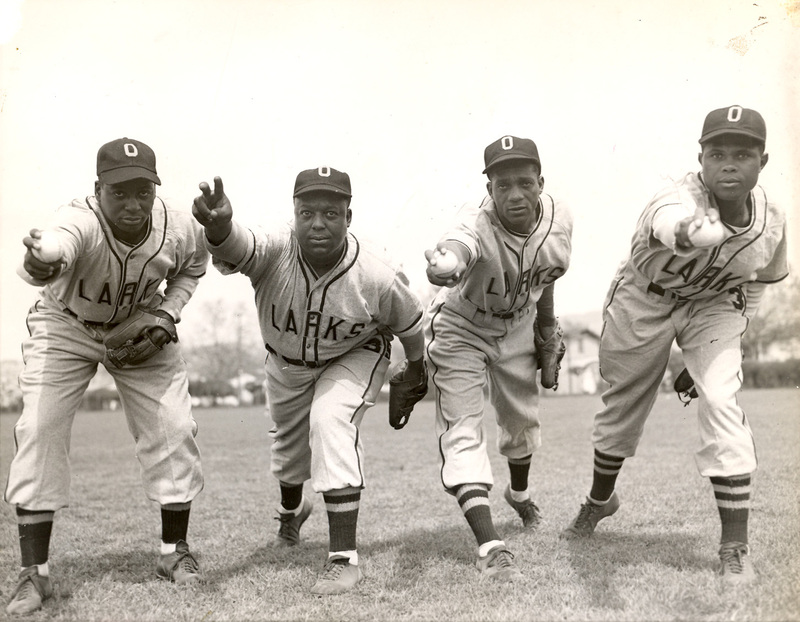 Four of the Oakland Larks starting pitchers are seen in this 1946 photograph. From left, they are: Wade James, "Wee Willie" Jones, Charles "Speck" Roberts, and Marion "Sugar" Cain. The Oaks were one of six franchises that began the 1946 season as the West Coast Baseball Association, an all-African American league that was formed because blacks were excluded at the time from professional baseball. The league folded later that season and Jackie Robinson broke the major league color line a year later.